There many times when the virus, malware, spyware or adware that has infected your computer is impossible to get rid of. Sometimes your computer is unusable and the virus, malware, spyware or adware has hijacked your computer or at least appears to be doing so. If a computer has become so deeply infected with a virus, etc. threat that is unusable then the only option most people know of is to completely wipe out their computer and start from scratch, aka “Reformat Your Computer”, aka “Complete System Recovery” aka “Reinstall Windows”. I used to think the same way until several years ago when I was messing around with heavily virus infected computers at work and tried something out just for the hell of it. [adblockingdetector id=”2″]This method I messed around with turned out to the best method I have ever used to remove almost any virus, malware, spyware or adware off of any Windows XP, Vista, 7 or 8 PC. This advanced virus, malware, spyware and adware removal method is a bit of work and it will cost some money the first time you perform it (but still cheaper than taking it into a store to remove the viruses). It is very thorough and killer at removing almost all viruses, etc. threats and annoyances. NOTE: You can buy external hard drive enclosures at almost any computer store that sells parts. I prefer to buy them online at Amazon since they usually sell them for the lowest price. I have tested out many brands. So far the best quality brand I have tested is Vantec. I own a Vantec HDD enclosure at home and use 3 of them at work. None of them have ever died or failed me, unlike almost every other brands I have used. Here are links to various Ventec hard drive enclosures. You only need to buy one but there are 4 different types that work with different laptop and desktop models, old and newer. [adblockingdetector id=”4″]If you are unsure what type of hard drive you have. 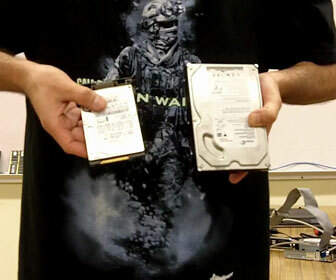 Before you buy anything you need to open up your computer and look at my first video below.In the first video below I show you what hard drives look like and I show you one of my hard drive enclosures and how to use it. IMPORTANT! If have not already checked out my basic to intermediate tutorial on “How-To Thoroughly Remove Malware, Spyware, Adware and Viruses from your PC for Free” I strongly suggest you do that first. It will remove a lot of viruses, malware, spyware and adware from a lot of computers. It will show you basics things I skipped in the advanced video tutorials below like where and how to download the 3 programs I use. It will also show you what scan settings to use on Kaspersky Anti-Virus, which is not covered in the video tutorials below.